Today in Class 1 we had such a nice Wednesday. The children did so well practicing their dance for Physical Festival. They all got pom-poms as a present from their friend! 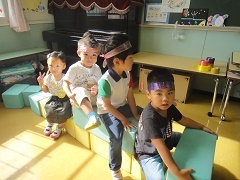 We went to Kitakaze Park with all the other IYK children and practiced the Physical Festival entrance ceremony. 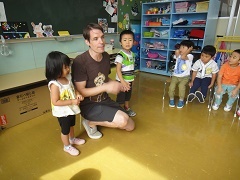 The Class 1 children did very well walking in a line, singing the school song, and exercising. They could follow teachers’ directions so well. Before we went home, we had time for a little ninja challenge. The children could all swing from the iron bar. They could twist on it too. It was a fun day full of smiles. Good job, everybody!